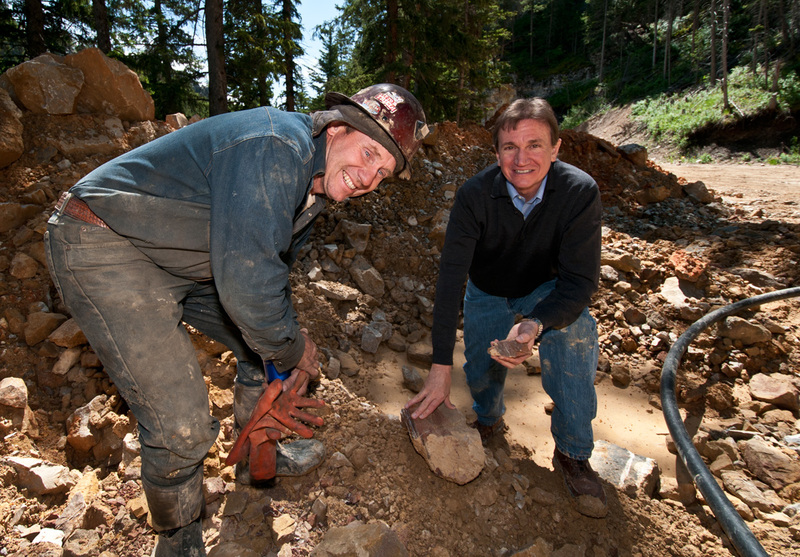 March 21, 2012—In 2005, Alaskan gold miner Mike Roberts was offered a trade. 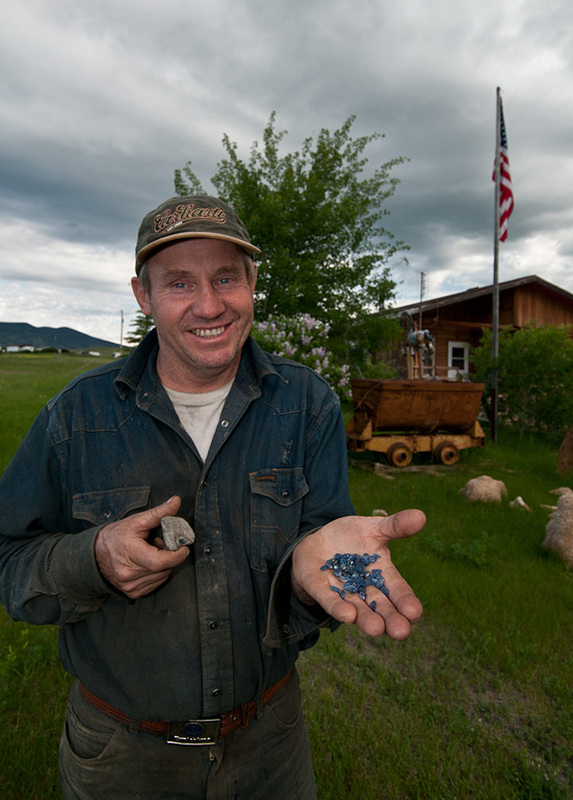 Lanny Perry owned the Vortex Sapphire Mine at Yogo Gulch, Montana and said he'd swap it straight across for Roberts' gold mine outside of Fairbanks. "Why not?" thought Roberts. And that's how he came to own what is now known as the Roberts Yogo Sapphire Mine. During the night of March 19, 2012, Mike Roberts had another accident. This time he was not so fortunate. A distress call went out; he didn't make it. The first thing one noticed about Mike Roberts was his smile, which is evident in the photos here. And if by chance you had the opportunity to visit his mine, you also quickly discovered his enthusiasm for the work. One day in July 2010, we visited his subterranean world, diving some 400-feet down into the Vortex extension of the world famous Yogo dike. With a depth of 7000 feet, the Yogo dike is the world's largest proven sapphire deposit. Mike Roberts and Bob Kane examining the tailings outside the Roberts Yogo Sapphire Mine. Click on the photo for a larger image. The Yogo deposit was discovered back in the 19th century, and worked for several decades by an English company. 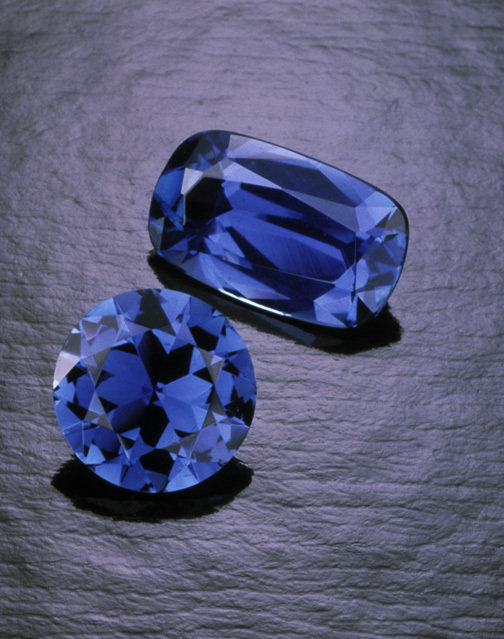 As anyone who has seen one can testify, in sizes above one carat, Yogo stones are world class sapphires. Sadly, perhaps only one in 10,000 of the crystals that are found will cut stones above a carat. This has kept Yogo sapphires as an inside secret. Few are traded outside the country, with the lion's share being gobbled up by collectors in the northwestern US. 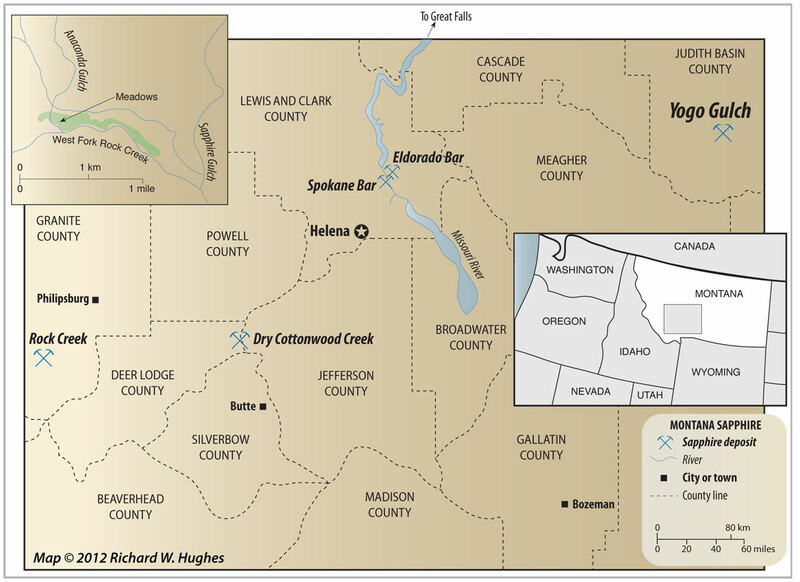 Map of central Montana showing the location of the Yogo mine. Click on the map for a larger image. 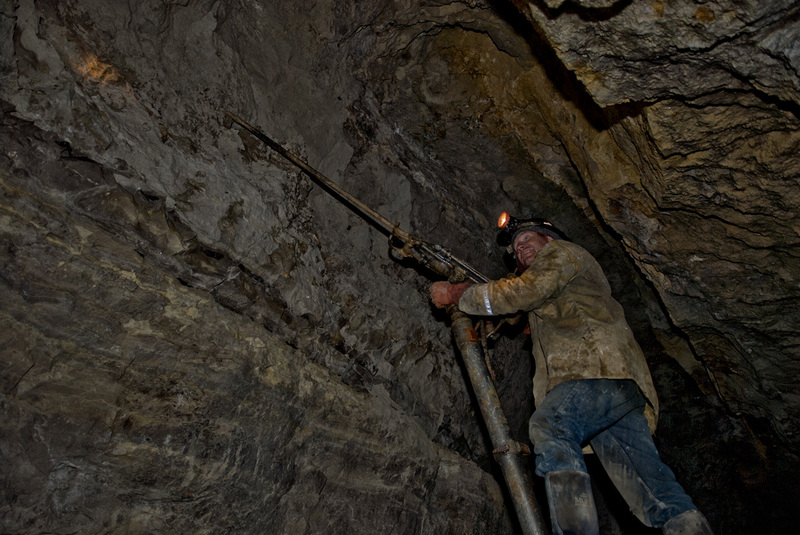 Mike Roberts working the sapphire-bearing vein at the Roberts Yogo Sapphire Mine. Click on the photo for a larger image. In the 19th century, the famous Tiffany & Co. gemologist George F. Kunz was sent a cigar box of stones by the original miner, and the famous NY jeweler has remained a strong fan of the blue stones from Big Sky. According to Roberts, Tiffany remained one of his biggest customers, but he just didn't produce enough for their needs. Now, with Roberts' death, it looks like Yogo sapphires could become even more scarce. Mike Roberts clearly knew the risks. And yet he loved his "underground mansion." As we spoke with him in 2010, he nonchalantly described his previous accident—what for ordinary folk like us would be akin to kissing death straight on the lips. He brushed it off. Working underground and alone, the danger was self-evident. No different than the mountain men who journeyed into the American wilderness centuries before. Living off the land, trapping, hunting, prospecting, dreaming. But as he spoke of the risks, his blue eyes sparkled like the sapphires he sought. The spark was there. 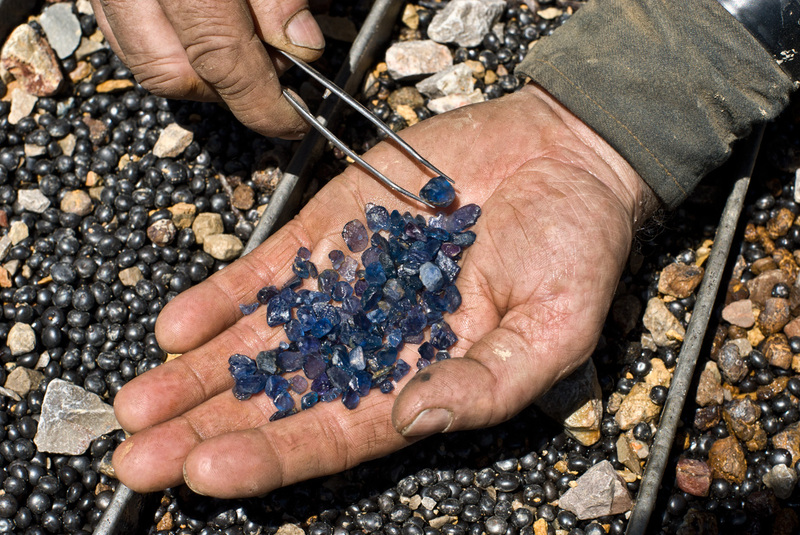 Two fine sapphires from Yogo Gulch, Montana. Photo courtesy Robert E. Kane & Fine Gems International; © Tino Hammid. Mike Roberts lived his dream and died with boots firmly on. He was a 19th century mountain man working in the 21st. Showing us all that life has far less to do with timing than hard work and passion. Mike, we were so lucky to have known you. 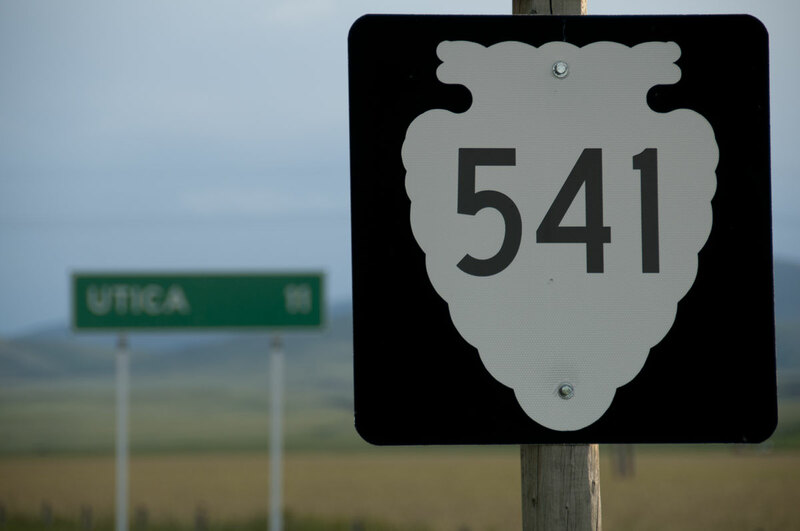 Catch you on the backside, somewhere down the 541. Wherever we end up, we'll find time to sit down together and share a beer, a burger and a tale or three. Sounds like Utica, doesn't it? Yes, let's meet in Utica. Mike Roberts is survived by his wife and three children. Our hearts go out to them. 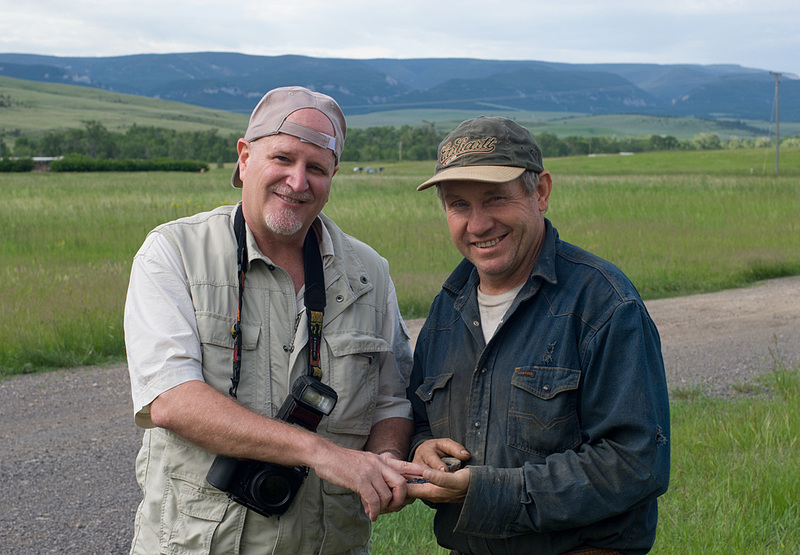 For more photographs of Mike Roberts and the Yogo Mine, see the Montana Sapphire album in our Shooting Galleries. Stiffler, Emily (2011) Blue gold. ExploreBigSky, June 19. Stukey, Katie (2012) Great Falls man dies in accident at Yogo mine near Utica. 3KRTV.com, March 20.